A case study of one of a garage clearance in Solihull. Clear the garage of all debris and render it usable. This home was a large, but ill maintained, Victorian property with attached garage. The home was inherited from a recently deceased widower who had worked as a contractor in his earlier years. The family who inherited it hoped to sell the property quickly and therefore needed the garage clearance completed quickly. This Solihull property proved to have some unique challenges. The garage door, while large (2 meters tall by 3 meters wide) had long rusted shut. Leaving the only access point, a small entrance door at the end of a narrow hallway inside the house. 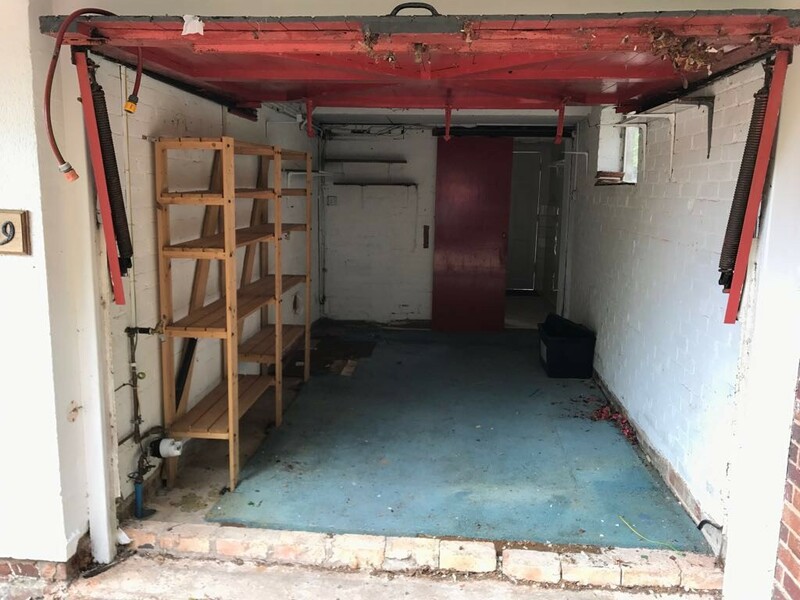 Upon initial inspection of the garage we discovered that it had long been used for the storage of construction materials and the debris of life. We also discovered several toxic substances in the garage, including long expired epoxies, lead based paints, car batteries from the 1970s, and various other potentially hazardous items. Furthermore, the Solihull garage contained several items, including a car engine, which could not easily be lifted. It was clear that this property would require: hazardous waste removal, some heaving lifting, and a careful eye. With a ‘can do’ attitude our moving team arrived at 9am and quickly set about removing the most dangerous items first for this garage clearance. Luckily our company is well equipped to handle potentially dangerous chemicals. We were able to successfully dispose of them without spilling any in the home, or exposing our clients or ourselves to poisons. The Solihull clients were pleased to learn that the dangerous chemicals would be disposed of in an environmentally sustainable fashion. Next came the heavy lifting. Using specialised equipment our team removed the car engine, which the tenants later sold; covering a large portion of the clearance costs. Likewise, the team removed a steel work bench, a large chest of tools, and an oak bed headboard, behind which we discovered a long abandoned rat’s nest, which we also cleaned. Finally came the smaller items, assorted cardboard boxes, mason jars full of tools, and racks of old clothing. In an effort to not destroy anything valuable, the items were searched through item by item. The tenants were pleased to see the old family photos we discovered amongst the detritus in this garage clearance. Much to the surprise of our clients, we completed the garage clearance in less than 3 hours; removing all potentially dangerous items in a safe manner. We also provided basic appraisals on the client’s items; including the car engine and tools. Finally we suggested several trust worthy contractors capable of fixing their garage door. 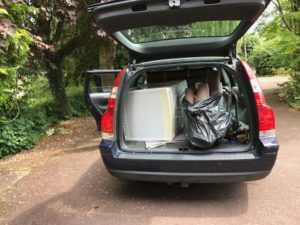 Do you require a Solihull Garage clearance? We are available 9am to 8pm Monday to Sunday and have years of experience in the Solihull area including Dorridge, Knowle, Shirley and Meriden. Please don’t hesitate to get in touch, we’re a sympathetic professional service running for over 30 years with experience in a multitude of housing types.